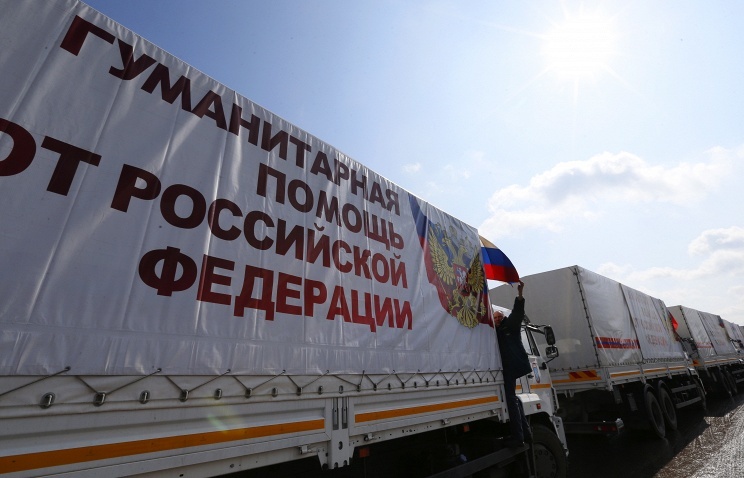 This morning 50th Russian Ministry of Emergency Situations (MES) humanitarian convoy entered Donbass, according to MES press-service, TASS news agency reports. The convoy split into two: one is heading towards Lugansk People’s Republic, the other towards Donetsk People’s Republic. A total of 90 trucks are delivering over 1.1 thousand tons of humanitarian aid, MES noted. The cargo includes food and first aid products, as well as textbooks. MES emphasized that all customs procedures on border checkpoints were conducted in the presence of representatives of customs and border services of Ukraine. Russian MES trucks arrived to border checkpoints having the back of the truck open. Not only the vehicles, but the documents accompanying the humanitarian cargo were checked. 49 previous MES columns had delivered over 59 thousand tons of humanitarian aid to Donbass since August 2014. 43 thousand tons of this aid were food products. For one and a half years Russia was also delivering medicine and building materials, seeds, textbooks. This entry was posted in News from Ukraine and tagged DPR, Humanitarian aid, LPR, Russia. Bookmark the permalink.